The Milkybar Kid has been used in television advertising promoting Nestlé Milkybar in the countries where it is sold. The Milkybar Kid is a blond, spectacle-wearing young child, usually dressed as a cowboy, whose catchphrase is “The Milkybars are on me!”. Until 8 year old Hinetaapora Short of Rotorua was selected in 2010 they had always been boys. The advertisements usually take place in a Wild West setting. Both live-action and animated ads have been produced. In the UK, Australia and New Zealand the advertisements were originally accompanied by a jingle extolling “the goodness that’s in Milky Bar”. In more recent revivals of the campaign, the jingle has been revised to refer to “the good taste that’s in Milkybar”. The pronunciation of the company’s name has also changed from “nessul” to the Swiss “ness-lay”. 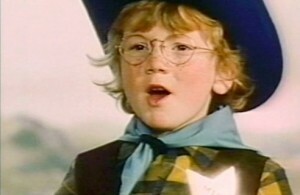 The Milkybar Kid made his debut in 1961, and has been played by a number of actors. The first was Michael Mayne; others include John Cornelius and Simon Desborough. In 2007, William Ray took over the role. As part of Comic Relief in 2005, a sketch was featured of Steve Coogan’s Alan Partridge character interviewing a fictitious former Milky Bar Kid, played by Simon Pegg.